We have ran tests of most of the leading spinner baits on the market, including titanium of course. These are run in a designated indoor tank by our staff engineers under exacting conditions. All lights must be turned off when tests are run. Our underwater mikes are so sensitive they pick up sound from fluorescent bulbs. We use a "standard" spinner bait and compare everything to it. The mikes feed their out put into a recorder and thus creating a tape which is fed into a computer using our priority software and the results are printed out of all data in charts, graphs, etc. 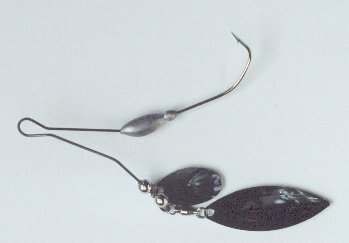 We ran tests on a number of "R" bend baits, and the results were so bad that I seriously wonder why they were even made. If your a trophy fisherman you just might get the biggest fish around and your chances of having the line go into the blades are great. And this includes Titanium especially. Of the tests we ran titanium baits knots slipped up into the blades at the lowest poundage - 18#, nickel chrome 23#. In contrast with our new cross over wire (with head mounted) actually straightens 4/0 mustang hook before the knot moved at 40# plus. Now that's strong! We removed the blades and skirt to show you how our scent is dispensed from ScentHead. With the blades and skirt on, it mixes it in the water to create a wider "trail". This is the original test tank photo as scanned. This picture is real. No time delays. What you see is what you get. The bait is actually moving. This is the scanned photo cropped with brightness and contrast increased. This is the scanned photo with computer boosted red colors (the color of the scent) and other colors reduced, for the clearest view of the scent trail.